Stephen Hawking died on Wednesday at his home in Cambridge, England. He was 76 years old. 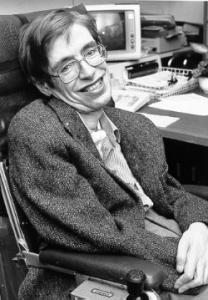 Hawking was a great scientist who contributed much to our understanding of the Universe and our place in it. More important, perhaps, was the heroic way he dealt with the cruel blow that fate dealt him. He made the best of a truly terrible situation, and for that each of us can take inspiration. Sad….another one enters the event horizon of eternal darkness and its overwhelmingly dominant gravitational grip and now forever is there. Damn its sad to see people like him go. I hope he didn’t suffer. So let us remember him. Such a loss to science. Rest in Peace Professor. Amazing he lived so long with ALS, and kept his full mental faculty the whole time. He was a real mensch. Here is Stephen Hawking having some fun singing Monty Python’s “Galaxy Song” in 2014. 🙂 Love this video showing Hawking’s humor. The chariot of Helios, unoccupied…..